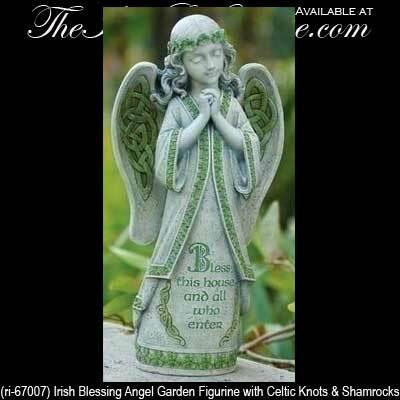 Irish angel statue for your garden features a home blessing along with Celtic knot-work. Bless this house and all who enter. Due to the weight and size of this Irish blessing angel, it ships separately and ONLY by ground freight. Typical delivery is 5 - 7 days. This Irish garden angel is complete with a house blessing along with Celtic knot-work and shamrocks. The Irish blessing angel offers great detail with a dimensional design that is enhanced with a shamrock laurel on her head and additional shamrocks on her gown. There are also green Celtic knot-work on her gown and her wings feature a Celtic knot motif. The Celtic garden angel is made of a stone and resin mix and measures 7 3/4" wide x 14 1/2" tall x 4 3/4" deep.